Colin Green Photography: Sowerby Bridge Railway Station. A selection of Pictures. 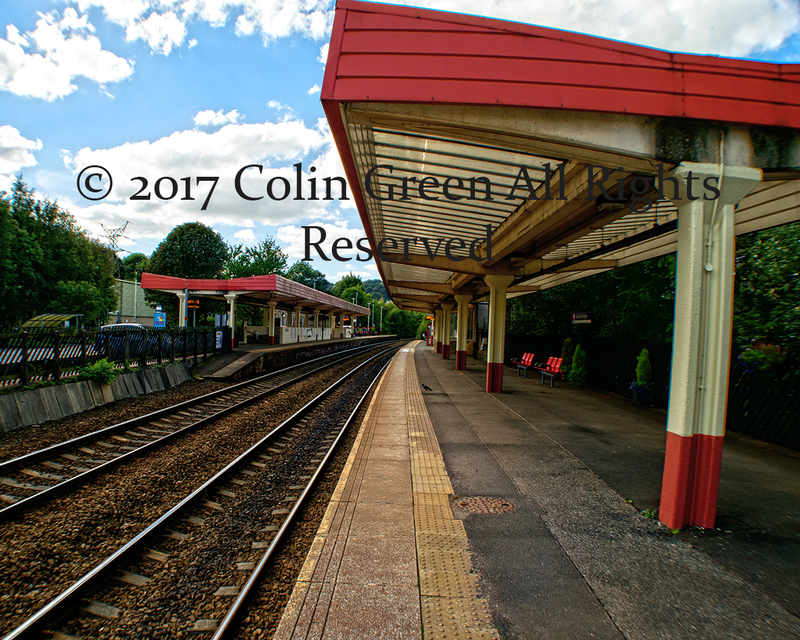 Sowerby Bridge Railway Station. A selection of Pictures. The current Sowerby Bridge railway station was opened on September 1st 1876 and has seen many changes since that date. The original station was further west along the line on the site of the current Tesco supermarket in the town approx. 0.4 miles from the current site. This station opened on the October 5th 1840 but was moved due to being too small and was considered to be too far away from the town centre. 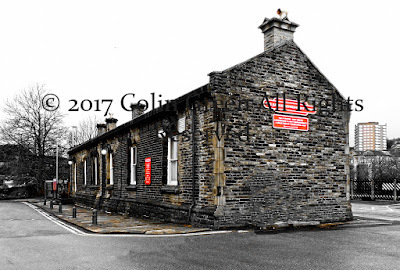 The new station opened on the junction for the Rishworth branch line which opened on august 5th 1878 and closed with the last train on September 1st 1958. The original station building at this site was badly damaged by fire October 1978 and the demolition of this building took place in November 1980 leaving just one remaining part that became the ticket office until 1983, this is now the jubilee refreshment rooms and opened in 2008. The station is much smaller than originally and is currently unstaffed. There are 15 abandoned and derelict coal drops within 100 metres of the station that were built around 1875. Branwell Bronte the brother of Charlotte, Emily, & Anne was employed here as assistant clerk in charge from October 1840 until March 1841. There is a blue plaque that commemorates this at the station. 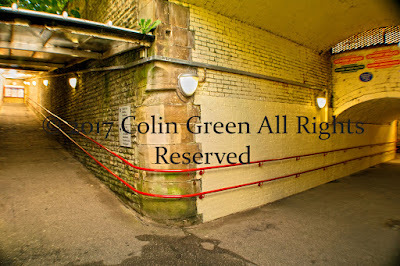 I currently have 2 sets of pictures available taken at the station. The first set can be viewed on Clickasnap at, Sowerby Bridge Album. Click here to view "Which Path To Follow"
This picture can be viewed best quality, full size and without copyright tags on Clickasnap via the above link. I receive a small contributors fee for all views of over 10 seconds. This picture can also be purchased in various formats and frames from as little as £1 up to £150. Click here to view my picture "The Slope"
This picture can be viewed best quality, full size and without copyright tags on Clickasnap via the above link. I receive a small contributors fee for all views of over 10 seconds. 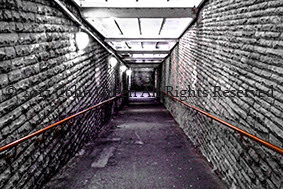 This picture can also be purchased in various formats and frames from as little as £1 up to £87. Click here to view my picture "Platform Waiting"
This picture can be viewed best quality, full size and without copyright tags on Clickasnap via the above link. I receive a small contributors fee for all views of over 10 seconds. This picture can also be purchased in various formats and frames from as little as £1 up to £121. The prices vary due to type of frame, print, canvass or whether simply just a download. The following short video was taken walking through the subway and can be seen here and also on my YouTube channel. It was simply a mistake as the camera was switched on and running as I walked through for about 28 seconds, but hey waste not want not. The other set of 10 pictures can be viewed on Flickr using the arrows or click to view full size on Flickr. You can follow me on Facebook, Twitter, Tumblr, Pinterest.and Clickasnap. Please take a moment to view my pictures on clickasnap as the photographer receives a small payment from them for any photos viewed over 10 seconds. You can now also purchase wall art, gifts, digital downloads and prints of my pictures listed on the clickasnap marketplace. If you would like to donate to my site or time you can do so by clicking the Paypal button below.